This traditional love seat boasts a classic look that you'll love for years to come. A tight seat back is accented with decorative nail heads, which are repeated on the base for a more cohesive look. Rolled arms frame either end with classic curves, and turned post feet in a dark finish complete the love seat's base. 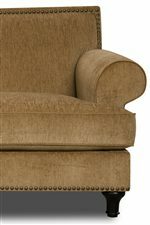 Shown in Abridge Toasted Pecan, this style is available in an array of upholstery coverings. The 129K Traditional Love Seat with Tight Seat Back by Bauhaus at AHFA in the area. Product availability may vary. Contact us for the most current availability on this product. Tailoring Decorative nail heads line the seat back and base. Seat Support Sinuous spring systems with double springing on each end to ensure an even seat. Padding & Ergonomics Cushions are 1.8 foam Dacron wrapped to ensure comfort. This beautiful living room collection boasts a classic look that you'll love for years to come. Design elements repeated throughout the collection include rolled arms, turned post feet and tight seat backs accented with decorative nail heads, which are repeated on the bases for a more cohesive look. Shown in Abridge Toasted Pecan, this collection is available in an array of upholstery coverings. Arm chair (not shown) also available. The 129K collection is a great option if you are looking for Traditional furniture in the area. Browse other items in the 129K collection from AHFA in the area.